When the weather is chilly or rainy, there's nothing as comforting as coming home to the warm glow of Avalon’s Newport Bay Pellet Insert. Pellet heating is one of today's hottest warming trends, and the Newport Bay pellet insert is a truly exceptional value in heating technology. From its exclusive auto igniter to its easy-to-clean components, it is the most reliable system available today! Easy to fuel – the Newport Pellet Insert is designed for convenience. The top lifts up and locks to allow easy access to the 35 lb. capacity hopper, which will provide you with up to 30 hours of uninterrupted heating. Easy to operate, too – the Newport’s unique circuit board allows you to run your pellet stove manually simply by pushing the start button or automatically, controlled by a thermostat set to your desired comfort level! 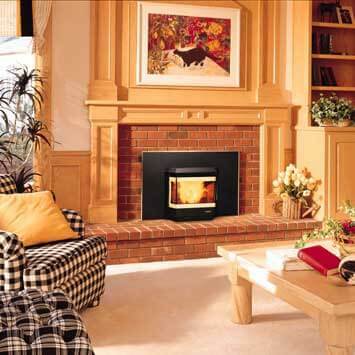 Easy to live with – the exciting Newport Bay Pellet Insert will install in your inefficient, drafty masonry or metal fireplace. This compact fireplace insert is designed to heat up to 1,600-sq. ft. and features a unique two-stage convection system providing you the maximum heat value for your money. The Newport Bay pellet insert is also designed to be easy to maintain without any special tools. The standard Newport Bay insert is shipped with a black door and grill. Optional brushed nickel or 24K gold (as shown here) doors and grills are also available.